I think by now it’s clear that I adore homemade Oreo’s. I have not one, not two, but three versions on this site and this will be the fourth. Homemade Oreo addiction? Yeah, but can you blame me? Also, I just want to point out that only one of the now four recipes does not include peanut butter. To me, peanut butter and Oreo’s are like fries and ketchup or bread and butter, they just go together. You can blame this little peanut butter/Oreo thing completely on The Parent Trap. Ever since I saw cute little Lindsay Lohan dipping her Oreo’s into her peanut butter, I have had to do the same. Actually, to be honest, I really haven’t had a REAL Oreo since like 4th Grade. 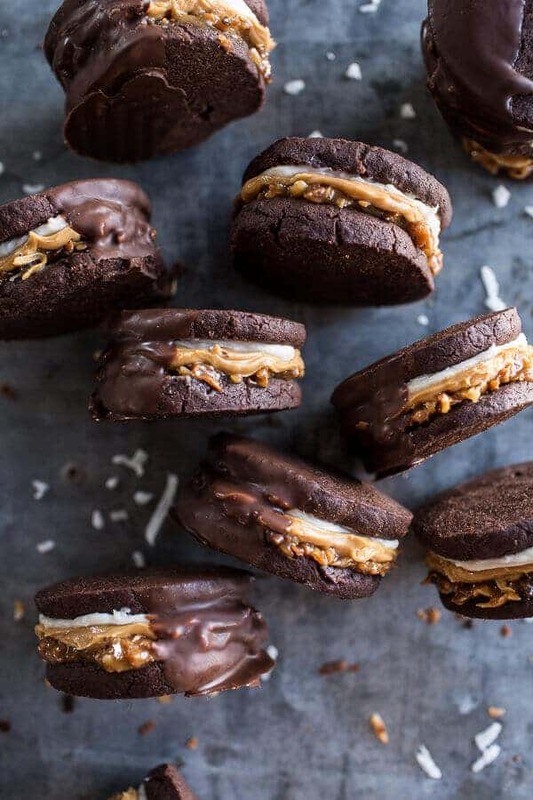 These days I eat homemade Oreo’s… made with peanut butter… and add things like coconut caramel. So much better! Ok, so now that st. Patrick’s Day is over I have moved on to Easter. It’s actually not that far away. As a kid my mom and grandma would put together the best Easter baskets and my mom would stay up till all hours of the night just trying to fill them all. My family would usually be on vacation in Florida over Easter, so my mom would bring along a few Malley’s chocolate bunnies for each basket but she was NEVER truly prepared. I remember one Easter, she and I where driving around close to midnight looking for stores that were still open that sold candy. I think we ended up stopping at a 24-hour Walgreen’s, but hey, she got it done. Just like she always does. Our baskets were really just mostly candy from Malley’s along with loads of Reese’s, but being kids we clearly loved that! I am not really sure what other families do for their Easter baskets (if you celebrate), but no matter what you do, I’m declaring that you need to include these Oreo’s. Just be sure not to hide the baskets outside in the Florida sunshine cause ah, they’re gonna melt for sure. Really though, I know they are a little untraditional for Easter baskets, but wouldn’t these be the best treats to open up? If you pack them carefully they could really work out great!! If you’re not into the whole Easter basket idea, eating one and then another and maybe even another works pretty fricking awesome too. I just wouldn’t head out in a bikini soon after. Sadly the two are probably not best friends, but then again is a bikini really anyone’s best friend? Didn’t think so. Stick with these Oreo’s, nothin’ wrong with a little indulgence here and there, especially on a holiday! Ok, but in all seriousness now, these are one of my favorite Oreos. I mean, the mocha ice cream Oreo is obviously up there and a definite rival to this Oreo, but I REALLY love this coconut version. It’s just like those Samoa Girl Scout cookies. 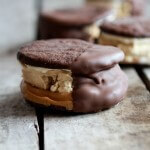 Think Oreo, stuffed with Samoa, but made way better, AND with the awesome addition of peanut butter. 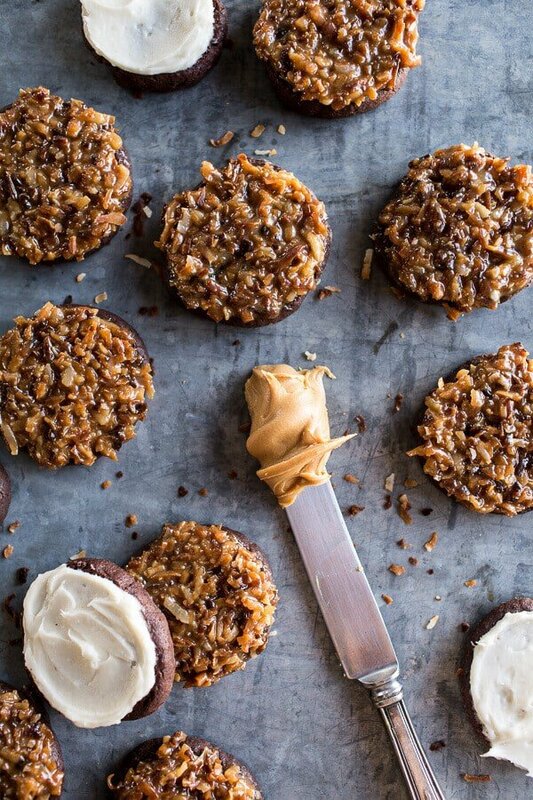 FYI, peanut butter, chocolate and coconut just make my world go round! Life would not be the same without them. <–Truth. 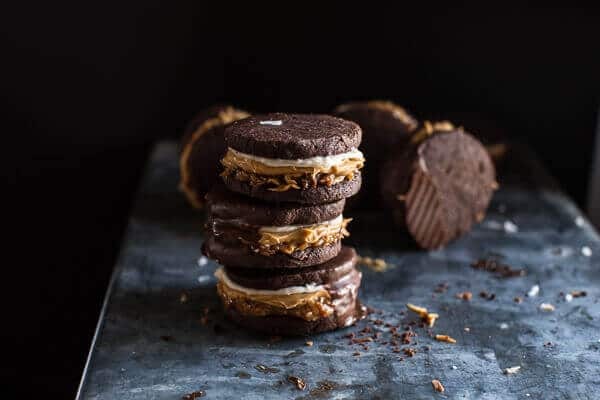 If you are looking at this Homemade Peanut Butter Samoa Oreo Cookies recipe and thinking there are way too many steps, think again. I mean, yes, there are a number of steps, but they are all simple and easy. I will admit that the chilling time for the cookie dough is a little annoying, but just plan a little ahead (like make the dough the night before and the rest will be so much easier). Then you’ll be good to go. Finally, happy first day of SPRING!! Let’s celebrate with tropical-ish coconut Oreo’s! Nothin' wrong with a little indulgence here and there, especially on a holiday! And spoons of peanut butter and chocolate for dipping…of course…it’s Friday! Wow I’m on board for these cookies. Love Grater’s peanut butter eggs and we have another place called The Sweet Tooth and they have peanut butter meltaways. Oh I think I’m in trouble this year for Easter because I’m craving the candy already. No way! 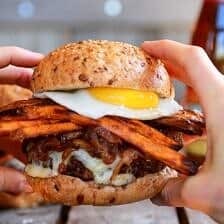 We must have some kind of telepathy going on because I totally posted a somoa recipe today too! Crazy right? So, these cookies would have been the highlight of any Easter basket when I was little. I am definitely going to have to try them! Samoas? Oreos? Peanut butter? This may be my favorite thing in the history of cookie creations. Your photographs are beautiful and I’m convinced that I need all of these in my life. I can’t even HANDLE THESE. Samoa and Oreos?! I most definitely won’t be waiting for Easter to pop about 6 of these into my face hole! 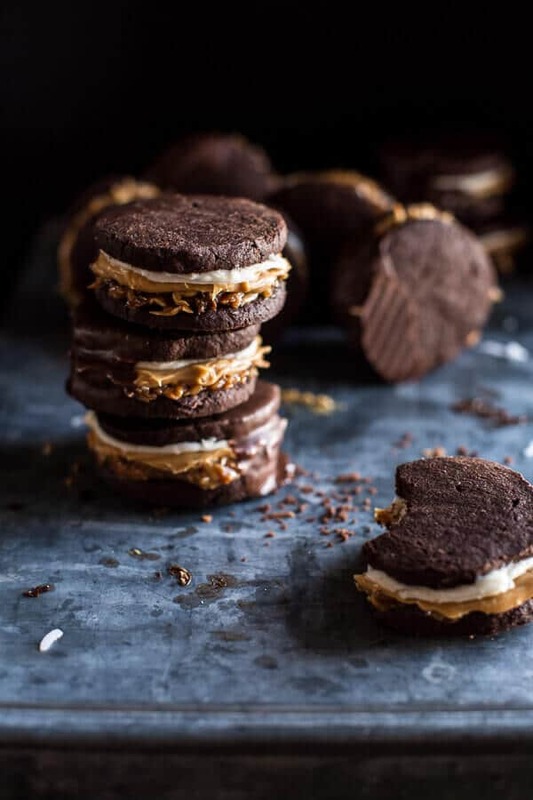 And, you’re right – peanut butter and Oreos? IT’S A MUST! Pinned! What?! These are PHENOMENAL! It’s like all of my favorite things combined into one amazing thing. Just beautiful. If these were real Girl Scout cookies I would order like 12 boxes. These are incredible! 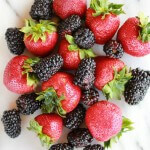 I love that you make typical “store-bought” foods from scratch (like your chips-ahoy cereal bites)! Obviously these oreos look incredible and way better than their original counterpart so I will have to make these STAT! This is such a perfect recipe! 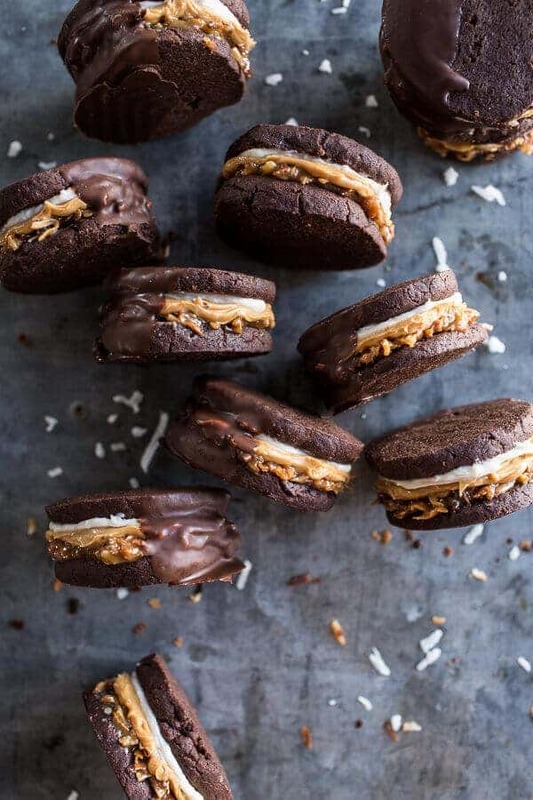 I love every kind of Oreo and everything with caramel or coconut, so this sounds like all of my favorite things in one cookie. I can’t even imagine how delicious this should be! The Parent Trap got me hooked on Oreos and peanut butter too! Such a great snack. This past 4th of July, my cousins and I sat outside on the beach and devoured an entire box while watching the fireworks 🙂 Samoas are my favorite GS cookies and these homemade oreos are divine! 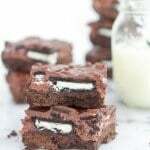 Ok, so Oreo recipes are the best and this one is ANOTHER hit!! Gah! Dying for one of these!! Holy Smokes these look so good! When I have a self loathing moment these will be by my side! Yum! Yum! I’m salivating over here. 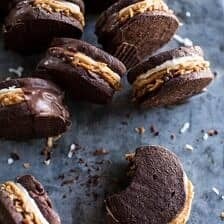 I love homemade oreos and these look divine! 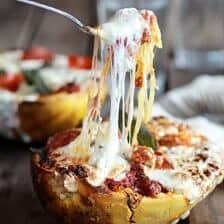 My husband would possibly marry me all over again if I made these! 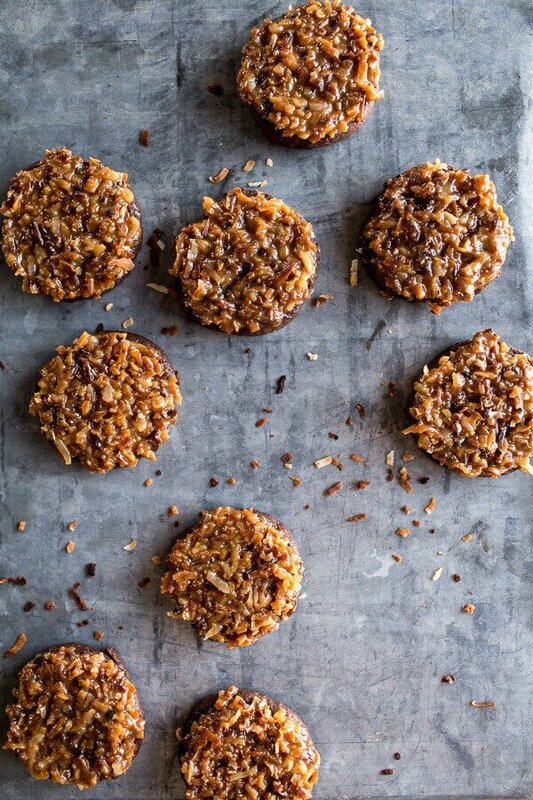 These are definitely getting a whirl in my kitchen. I hope they look and taste half as good as yours. Thanks for the inspiration!! Oh my Goodness! It’s my boyfriend’s birthday soon and I’m sure he would love those! YEAH! Hope you both love them, thanks! I love them, now I just have to keep my husband away from them while they cool. That Parent Trap reference cracked me up. Ahhh such a classic movie. YESSS 100% to oreos with peanut butter! Best. Ever. Just been reading through your blog and I just love it! 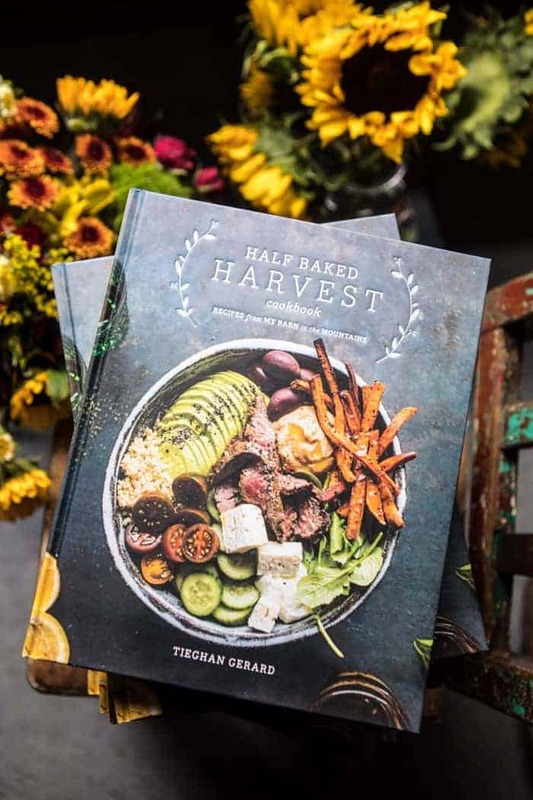 Such fab recipes, photography and words – you go gal. Also, THANK YOU! I love your work, so these word me ALOT! Have a great week! 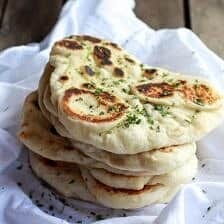 I’m dying over here with this recipe Tieghan! 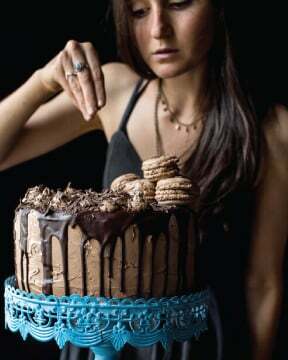 Only a couple more weeks and I can bake again! 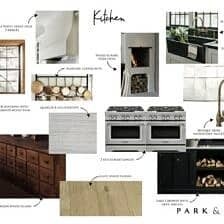 Looking forward to making these! 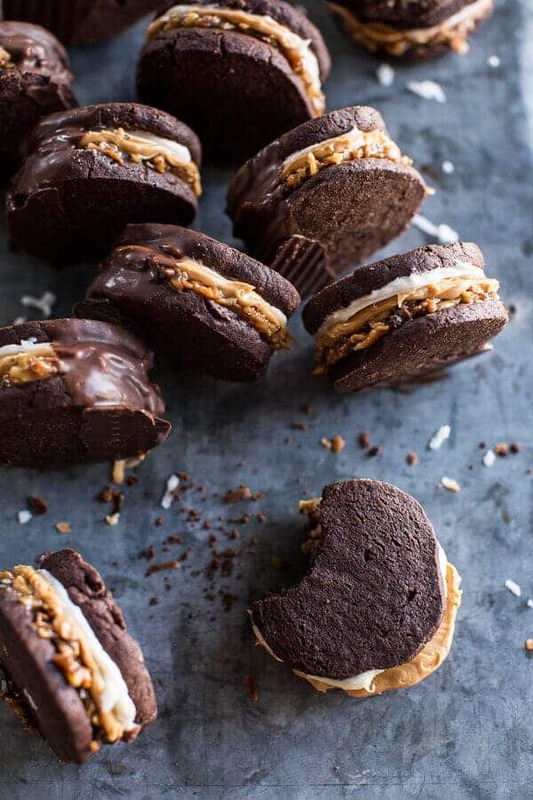 You’ve done it again, these Oreos look epic! 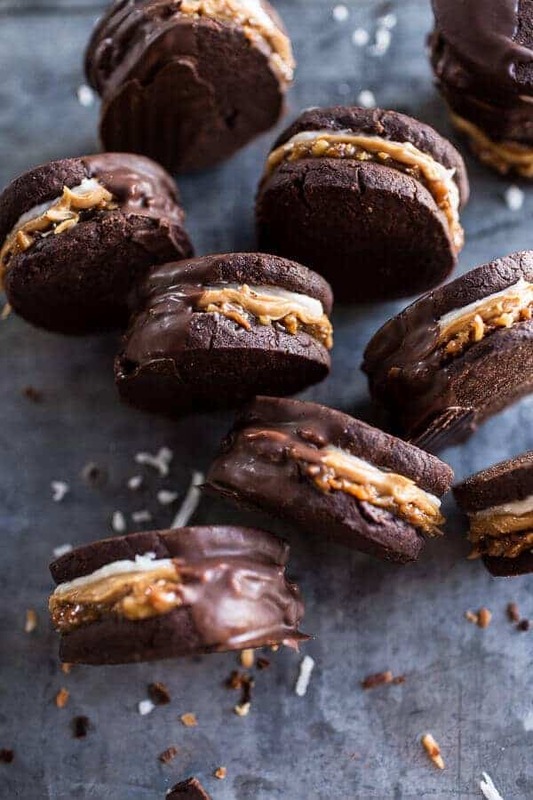 Coconut caramel, that dip in chocolate… I’m loving it all! I used light, but either or will work. Hope you enjoy these! Wow, temptation overload! 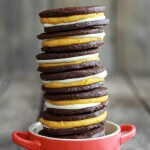 This cookie recipe is just decadent! Thank you so much, Sommer! Hope you had a great weekend! Oh, come on now. This is just plain sinful. I mean chocolate and peanut butter AND Oreos *AND* Samoas !!! stop it. i need these. RIGHT NOW! I am so inspired your recipes! I’m just a hobby food blogger. Hoping to make it into the big-time like you one day! Cheers! OMW what are you doing to me 🙂 ??? This sounds like pure heaven….I am so doing these….and like ‘yesterday’. These have always been one of my favorite snacks! Love this! Can I post the picture? Thanks! ANd yes, if you provide proper credit and a link back to my site for the recipe. I used my own photo but they came out amazing! What camera do you use?